Great park - some sidewalks and trails but mainly dedicated to disc golf. Several creeks and nice elevation throughout. 2018 redesign. 820 West; exit at Clifford and go east to left on Saddle Rd then right on Wilbur St. 1st tee is 100' north of the parking lot at the end of Wilbur. One of my favorite courses in the DFW area. Now with 19 holes and new concrete pads this is a course to check out. Pros: Variability. There is very little overlap between holes. It is rarely packed. Well maintained and the layout frequently changes. Cons: Signage is needed. #5 and #14 can throw your navigation off if you are unfamiliar with the course. Standing water can be an issue after heavy rain on a few holes. This course has everything to enjoy and challenge your game. The creek, elevation changes and overall diversity of holes are some of the best in north TX. The redesigned course flows incredibly well and there are 19 holes now. The holes are very different and there are only a few holes that need a similar type of shot. It has Uphill, beautiful downhill, tight shots, long and short shots as well as turning shots. This course reminds me of Bicentennial in Crowley and ZBoaz in Benbrook. It isn’t as frustrating as those courses though and that makes it better to me. It also isn’t quite as long, so you can get a round in a little quicker. This course has very few cons but there are some. 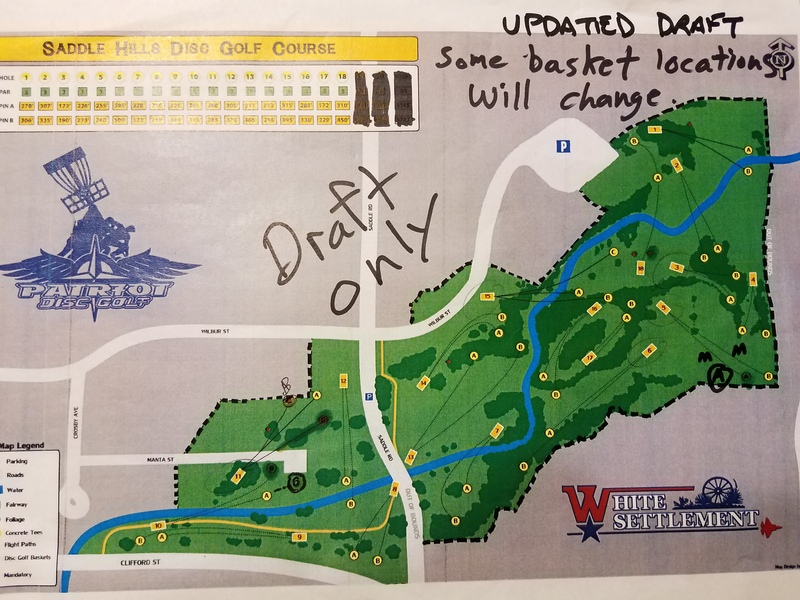 Signs on each hole would be great but the map on PDGA and dgcoursereview is good. More trash cans, better bridges through the creek and more benches would also make this park perfect. This feels like a completely new course. It was heavily redesigned in the winter of 2015 and the biggest improvement that finally puts this course on my “favorites” list is the huge cement tee-pads. Hole 5 and 14 are my favorite but the whole course is excellent. If you are in the Fort Worth/White Settlement area or passing through, then you have to play this course! This course is now 18 holes!! This must have happened relatively recently because the map next to the #1 tee box still only shows 8. Hole #6 is directly east of the #5 basket, and what was #6 is now #15. It's a challenging par 3 course and the first time you play it, many of the holes will have you saying "What?? You've got to be kidding me!" The drive for #3 is a blind shot over a hill, the basket for #4 is hidden over a drop off, and #14 will eat your disc if you don't either lay up on your drive or throw a hard fade left. But despite all that it's a lot of fun to play. My first time out I played it twice back to back. There is a creek in play for much of the course, but even after a long rain the water was only a few inches deep. Even though it is OB, you're not likely to lose a disc in the water. It's an ok place to play. It's a short course, and not because it's 9 holes. The measurements were shorter than on the tee signs. It has two tee spots, whites being the more difficult shot, but usually shorter placement as well. I don't imagine it ever being real busy. Overall 2-3, 2 because of it being shorter than stated. it's a good quick course with everything on it, it has elevation, trees and creek comes into play on a few holes. i just wish it was 18 instead of 9. open till 11pm.